SF State's Sarah Kurfess (5, left) and Melissa Horton (9) ready for a pass in their game against Cal State San Berndardino on Oct. 15. The Gators lost 3-0. Photo by Henry Nguyen. The SF State volleyball team failed to keep up against its most formidable opponent yet Saturday night, undefeated Cal State San Bernardino. The Coyotes, currently ranked third in the nation, made quick work of the Gators with a 3-0 sweep. The Gators looked like true contenders at the onset of the match, coming up with two big blocks against San Bernardino superstar Samantha Middleborn. 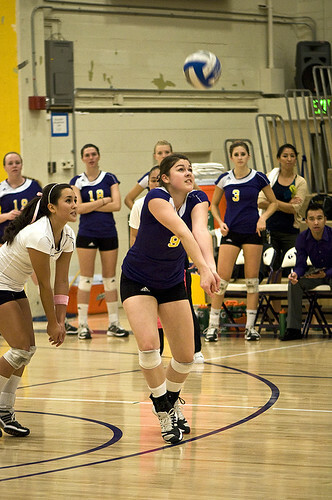 They stayed close behind for much of the first set until the Coyotes powered their way to a 25-21 win. Losing the first set changed the tone of night for the Gators, with 25-13 losses in the second and third sets. The Gators were clearly outmatched in the game and struggled to overcome the Coyotes dominating blockers. To put it in perspective, San Bernarndino has 8 players who are 6’ or taller. The Gators have two: Jazmine Williams, 6’, and Kelly Ostello, 6’1”. It was difficult for the team to see history repeat itself. “Especially coming from a game like yesterday, not closing off, and then starting this first game and not closing off… It was just tough, but hey, that’s why they’re number three in the nation,” Williams said. Although they couldn’t contain the entire Coyotes team, the Gators successfully limited Middleborn’s game. Before this weekend the top middle hitter in the country had a .511 hitting percentage, but hit only .286 against the Gators tonight. Still, Middleborn, who was been named CCAA Athlete of the Week three times this season alone, contributed with three serving aces and several big blocks. “It was just about knowing that we can really take it if we want to. That comes with being aggressive and still staying in it and being smarter, especially with that big block,” Walsh said. The Gators continue their homestand next weekend, hosting Cal State Stanislaus Friday and rival Chico State, currently ranked third in the CCAA, Saturday. The team previously lost to the Wildcats in Chico earlier in the season and need a win against them to keep playoff hopes alive.